Form G's are pretty versitile. They can authorize trains to proceed in one direction, make a round trip, or go in just about any combination of round trips (including going further than the originating station on the return) and directions. The only limitation is that a train may only make one round trip between any two points, because otherwise, in a worst case scenario, multiple trains making multiple round trips would have no idea where the other guy was at without a ton of extra train orders. Perish the thought. To deal with the multiple trip issue, a train must be classified as a Work Extra by Form H train order. At left is one of the Form G variations. 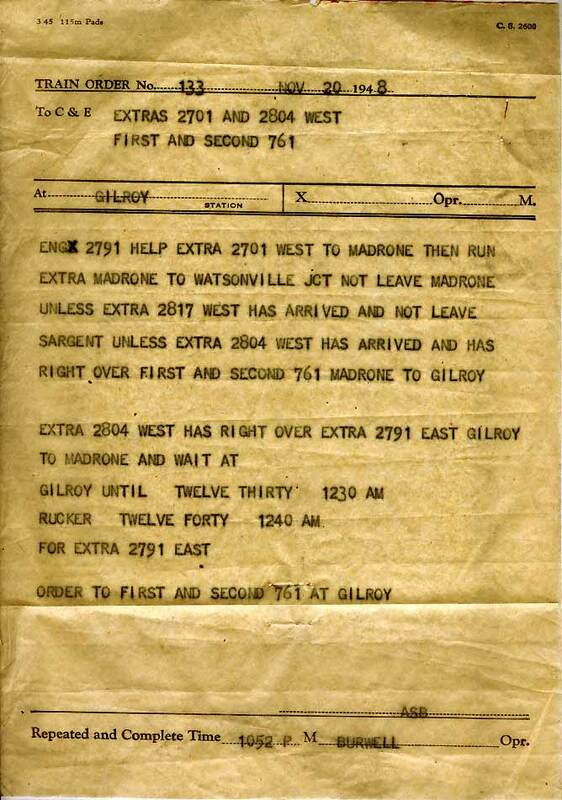 It straightforwardly tells the 9006 west's crew that, after the east man (running with Geep 9 #5640 as the road engine) arrives, they are authorized from Tracy over Altamont Pass and the Dumbarton Bridge to the double track at Belle Haven (where they will proceed under rule D-251), assuming that their Kraus Maffei doesn't throw a driveshaft through the cab floor. Here's the variation for a return trip. Note that it is issued to both the (presumably) King City local (2-8-2 #3264), and a train that may meet, or follow it, depending upon how the train order plot thickens. That's genuine steam engine goop on the flimsie, baby! We've said that train order forms are often combined, and this is actually a straightforward, easy to understand example once you absorb how each form works. As it is, you probably can figure out most of it now. Below, is a more complex combination of forms that contains a common, but non-standard Form G variation. It's kinda cool, so we've done it big. You won't find a Form G variation stating "help extra" in the rule book. Sometimes, the same instruction was issued as a message via telegram, instead, and we really don't know the exact reason why one was used rather than the other: whim or simplicity, maybe? This one ought to leave you scratching your head a little about who's on first. You'll understand the "WAIT AT" portion better after reading the "Column Wait" section further on. The order is interesting for a couple of other reasons. First, we'll bet that many of you don't know that the approaches in both directions to Morgan Hill (named after a man, not a mountain) were helper districts, typically using hogs (SP'ese for 2-8-0's), of which there were obviously many running around in the late Forties. Second, note the "ENGX 2791": that "X" is a strikeout, which along with a strikeover (typing a different letter over another), is a big no-no. We know that it's not an efficiency test of the T&E crews - intentional mistakes can be made only in the address area, not the body of the order, due to safety reasons. Nevertheless, if this order fell into the hand of a trainmaster, Operator Burwell and the crew members of Extras 2701, 2804 and First, Second 761 could all be in hot water for not issuing a corrected order. Of course, everybody involved knew that retyping the order might delay things considerably, and after all, most officials were snug in their beds at 10:52 pm. Further, in the freight world, it seems that you are on the verge of being fired for something most of the time, so what the heck...it's not an unsafe mistake.